Google Analytics already helps you gather deep insights into one website or app at a time. But what if you want to understand the overall performance and interactions of all your company’s digital properties? In today’s multi-touchpoint consumer world, this is a much greater priority. 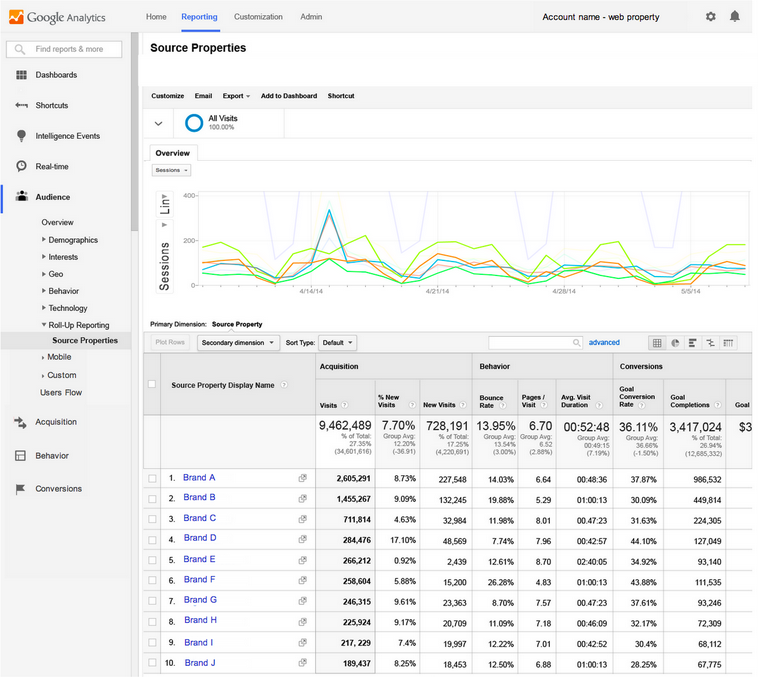 Today we’re launching Roll-Up Reporting in Google Analytics Premium to help address this need. Roll-Up Reporting is a single interface that moves your aggregate business data much closer to your high-level business decisions. One spot with aggregate data for all your sites and apps? Check. Key summaries with no compromises on data accuracy and segmentation? Check. Everything available in real time? Check. With Roll-Up Reporting, there's no need to export from dozens of properties and collate data offline. It's all built in. Suppose you want to compare the performance of the sites and apps for your company’s various brands, franchises or regional subsidiaries. The new Source Properties Report has you covered, with at-a-glance views of business units that are outperforming or underperforming. To compare specific segments, try using the new Source Property Display Name dimension in advanced segments, in custom reports, or as a secondary dimension. In many cases, Roll-Up Reporting can de-duplicate unique visitors across your websites and apps, so you can see the total unique-visitor reach of all your digital properties. You can also use segments to study the overlap and pathing of visitors who traverse several of your sites and apps. If your business owns multiple brands or franchises that target similar consumer populations, or if you expect the same consumer to interact with multiple marketing or landing sites over time, be sure to try this out. This is also a great way to tie together platform and device touchpoints. Google Analytics already provides powerful features, like cross device reports and single-view app and web data, to help you report on multiple types together. With Roll-Up Reporting, you’re no longer restricted to reporting on those tied to the same Google Analytics Property. That means more agile setups and more powerful analysis. 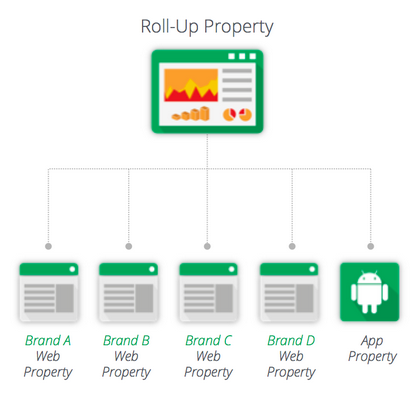 Roll-Up Reporting is made possible by Roll-Up Properties, a special type of Google Analytics property whose hit data comes exclusively from other Analytics properties. Setting up a Roll-Up Property is straightforward: no tagging changes needed. Simply select the Google Analytics properties that need to be reported on together, and Google Analytics will configure each selected property, called a Source Property, to forward a modified copy of all future hits it receives to the Roll-Up Property. To get started with Roll-Up Reporting, contact your Google Analytics Premium Account Manager to request your new Roll-Up Properties. To learn even more about Google Analytics Premium, contact your Google Account Manager or visit google.com/analytics/premium.